“That Flag Represents White Supremacy”: Confederate Flag Still Flies at South Carolina State Capitol | Democracy Now! 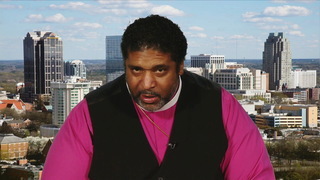 is a civil rights activist and community organizer in Columbia, South Carolina. He edited the book Killing Trayvons: An Anthology of American Violence and is the author of Waiting for Lightning to Strike: The Fundmentals of Black Politics. AMY GOODMAN: We turn to the battle in South Carolina over the Confederate flag, which still flies on the grounds of the state’s Capitol. The issue was reignited by last Wednesday’s massacre of nine African-American churchgoers by white supremacist suspect Dylann Roof. In photos posted online, Roof can be seen posing with the Confederate flag and in front of a car with a front license plate that reads, “Confederate States of America.” On Saturday, thousands attended a protest in the state capital, Columbia, calling for the flag’s removal. This is demonstrator Michaela Pilar Brown. MICHAELA PILAR BROWN: We know what that flag symbolizes. We know the hate. We know the danger. It says, “Stop.” It says, “You are not welcome here.” It says, “Fear for your life.” Take down the flag! Take it down. AMY GOODMAN: Meanwhile, Republican South Carolina State Representative Doug Brannon has announced his plans to sponsor legislation to take down the Confederate flag from the front of the state Capitol. Brannon said he reached the decision after losing his friend, State Senator Reverend Clementa Pinckney, in last week’s massacre. Brannon told CNN’s Poppy Harlow he regrets not taking action earlier. REP. DOUG BRANNON: I apologize to the people of South Carolina. I’ve been in the House for five years. I should have—I should have introduced this bill five years ago. I should not have let my friend—we shouldn’t be having this conversation. POPPY HARLOW: So let’s talk about why you didn’t—why you didn’t do it sooner. REP. DOUG BRANNON: Um, I didn’t do my job. AMY GOODMAN: The Confederate flag has flown near the state Legislature in Columbia since the early '60s. Opponents of the flag say it's an offensive symbol and a reminder of the painful legacy of slavery. Meanwhile, some Southern whites defend the flag as a symbol of their regional heritage. Well, for more, we go to Columbia, South Carolina, where we’re joined by Kevin Alexander Gray, civil rights activist, community organizer, who edited the book Killing Trayvons: An Anthology of American Violence. He is also the author of Waiting for Lightning to Strike: The Fundamentals of Black Politics. Kevin Alexander Gray, welcome to Democracy Now! Talk about the significance of this flag and of a white Republican state senator, Brannon, now saying he is incredibly sorry that he didn’t introduce this five years ago when he first became a state representative in Alabama [sic]. Kevin Gray? KEVIN ALEXANDER GRAY: Well, it’s South Carolina, and actually he’s from my home county, Spartanburg County, so I’m really proud that he’s sponsoring that bill. And, you know, listen. I heard the first interview, and we talk about white supremacy and Dylann Roof being an anomaly. Dylann Roof is not an anomaly. If you ride around South Carolina in some places, Confederate flags on bumper stickers, on license tags, on car windows, flying from people’s homes are as common as stop signs. And when you talk about white supremacy as a structure, you have to talk about white supremacy as a structure that permeates America, that the foundation of our politics in this country is white supremacy. White supremacy is not merely the Ku Klux Klan and race hate groups. White supremacy is a structure which keeps people down based on race, that keeps people in power. Racism is about power. You earlier had a FOP official on talking about race baiting, and which is just trying to flip the script, as we say it, on people that are challenging this idea of police power and the power—the white supremacy that’s involved in the police beatings and the police killings that have gone on across this country. To say I’m surprised—I’m hurt, because Clementa Pinckney was a friend. I don’t know the other martyrs like I knew him, but—and people are hurt and stunned. But to say that Dylann Roof, who drives down streets in this state named after Confederate war heroes, who walks in buildings in this state named after Confederate war heroes, a state in which the heroes of the Confederacy are honored on the state House grounds—the hero of putting white supremacy in the Constitution in South Carolina, Pitchfork Ben Tillman, who drove black people out of the state at gunpoint, are heroes in the state. His statue sits across from that Confederate flag that flies on the state House grounds right by the Confederate soldiers’ monument on the Robert E. Lee Highway. So that’s the nature of our country. Everything that Dylann Roof said, they’ve been saying it about black people since black people were kidnapped and brought into this country. The idea of white supremacy is to perpetuate the myth that this country is a land of immigrants, when it’s a land of immigrants and kidnapees. And for that young man to know about that church and to know the historical significance of that church, it’s not difficult to know in the history of this state because that’s the church that Denmark Vesey organized. It’s down the street from the College of Charleston, where Glenn McConnell, who was the leader of the Senate, who is a Confederate re-enactor, is now the president. So that’s the nature of this state. So, we have to talk about white supremacy just more broadly than that flag. Now, if we want to talk specifically about that flag, the flag that flies on the state House ground, a bad compromise that the NAACP agreed to with the state Legislature back in the '90s—that was a bad compromise—but the flag represents white supremacy. The original flag of the Confederacy, the stainless white banner, was a banner that was designed to represent a white man's country. So, you know, for us who are opposed to the flag being on the state House grounds and all those monuments, people can fly the flag at their homes, they can wear it by—put a flag bumper sticker on their car, they can wear it on their hats, they can wear it on their foreheads, but my tax dollar, people’s tax dollars, ought not go into supporting the idea of the Confederate States of America. When I was president of the ACLU back during the flag fight, we tried to make the legal argument, and we wanted to pursue it in court, that the flag flying on the state House dome was compelled speech, that you were compelling people to support an ideology of white supremacy. The NAACP, as I said, stepped in and negotiated with the state Legislature, and we got what we got. AMY GOODMAN: The bridge that thousands gathered on Sunday evening in solidarity with the victims is named after former Charleston Mayor Arthur Ravenel, who became a state senator. He supported flying the Confederate flag on the state Capitol. In a rally in 2000 in support of the flag, he referred to the NAACP as the National Association for Retarded People. Can you talk—speak to this issue, Kevin Gray? KEVIN ALEXANDER GRAY: Well, look, as I said, look, this is South Carolina. They revere that history. They are in denial about what that history represents—the expansion of slavery. And he is not the only one who has made statements like that. I mean, you know, there used to be—and he’s passed away now—a fellow who owned a chain of barbecue restaurants here in Columbia. Pat Buchanan actually set up his campaign headquarters at this gentleman’s headquarters for his barbecue empire. His name was Maurice Bessinger. And when the courts forced Maurice Bessinger to serve black patrons, he said, “I might have to serve the niggers, but I’m giving my money to the Ku Klux Klan.” So that is the nature of this state. South Carolina is proud that it was the first state to secede from the Union, that it fired those shots at Fort Sumter. This is the home of the Nullifiers, John C. Calhoun. When you hear Dr. King’s speeches and he talks about Southern governors, their words dripping with interposition and nullification, that language came out of South Carolina. South Carolina refused to sign the Declaration of Independence on the 2nd. There had to be a compromise to take out the anti-slavery clause, and so—and they signed it on the 4th. That was South Carolina’s influence in this history. So, black people celebrate the 4th of July along with other Americans, but that was really the day that slavery was codified in this country. So if we want to have a conversation about race in this country and the foundations of white supremacy and racism, it starts in South Carolina and the ideology of white supremacy that permeates our nation today with the Southernization of American politics. When we talk about Medicaid funding and Medicaid expansion and these Southern governors, like Nikki Haley, who fought against Medicaid expansion because they didn’t want to give something to undeserved—undeserving people, who they see as black people; when you talk about voter ID laws, trying to keep a group of people from having power, almost like literacy tests and knowing how many bubbles are in a bar of soap—they talk that game now about reconciliation, but everybody uses this code language, here and across the country, to deny black people and people of color rights. KEVIN ALEXANDER GRAY: This whole idea of—so, go ahead. I’m sorry. AMY GOODMAN: Interestingly, Governor Haley, the South Carolina governor, said, when asked about would she support taking down the Confederate flag, she said she didn’t want to introduce politics in this time of mourning. NEXT“A Classic Case of Terrorism”: Is FBI Ignoring White Violence by Refusing to Call Roof a Terrorist?